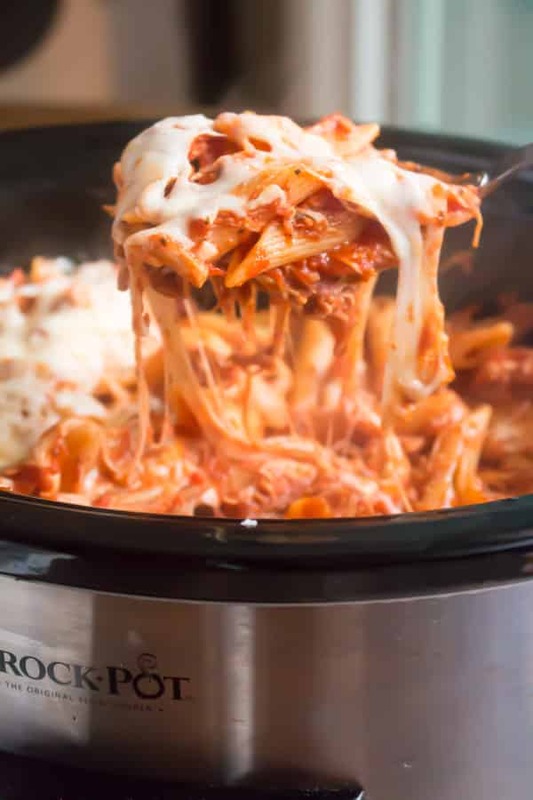 Today I’m sharing this easy recipe for Slow Cooker Chicken Parmesan and Pasta. My mom would always slow cook her sauce with meat all-day, she would stir her sauce often throughout the day. 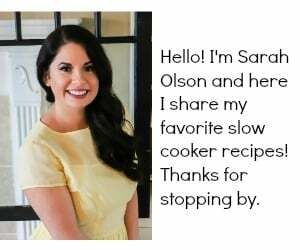 I like to use my slow cooker, so I can set it and walk away. I hadn’t cooked chicken in tomato sauce before this. The chicken turned out very flavorful slow cooked in this Ragu Tomato, Garlic and Onion sauce! It was nice to have a pasta dinner that wasn’t made with ground beef for a change. Below is the sauce after it had cooked all-day with the chicken. Doesn’t it look good? This made the house smell heavenly while it cooked! After the chicken and sauce was ready, I stirred in 1 pound of cooked penne pasta. I topped the pasta with 2 types of cheeses. Put the lid back on to let the cheese melt. This was the easiest chicken Parmesan I have ever made. My daughter loved this meal! She and I ate this on our way out the door to girl scouts. I left the slow cooker on warm for my husband who comes home after we have left for girl scouts. Did you know that Ragu sauce has no artificial flavors, no artificial colors, and no high fructose corn syrup? And Ragu always seems to be the most cost-effective choice as well. Have a great week! I will be back soon with another recipe. Add the chicken to a 6-quart or larger slow cooker. Sprinkle over the salt, pepper and oregano. Pour over the Ragu Chunky Tomato Sauce. Cover and cook on HIGH for 4 hours or LOW for 6-8 hours, without opening the lid during the cooking time. When the slow cooker is done cooking, prepare the pasta on the stove-top according to the package directions. While the pasta is cooking, remove the chicken on to a plate and cut into bite size pieces, the chicken will shred very easy, but I still like to cut it up a bit so there isn't long strings of chicken. Add the chicken back to the sauce. Drain the pasta very well. Add the pasta to the chicken and sauce in the slow cooker. Stir. Flatten the pasta out into an even layer. Sprinkle over the shredded mozzarella cheese and parmesan cheese. Cover for 15 more minutes, or until the cheese has melted. Can I put the chicken into the crockpot frozen? This recipe is full of cheesy goodness. I hadn’t had Ragu in years and tried it recently. I loved it. I keep it in the pantry now for quick easy meals like this. I think I am making this for Christmas! it looks divine! I recently rediscovered Ragu sauce and I think it tastes great! I love it in this dish! This looks absolutely delicious! And yes- easiest chicken parmesan ever! 🙂 Can’t wait to try this soon. Love all the Ragu flavor options! This meal is great to have ready during the holidays when we’re in and out of the house so much. That looks so good and perfect for these chillier evenings! just curious , if you leave the pasta in long wont it get all mushy? Yes, I serve it right away and pack up leftovers too. Do u put the chicken in frozen? Thanks for the recipe! Did you have any issues with the water from the chicken making the sauce too runny? I am making this right now. I am adding zucchini to it for some extra vegies. I can’t wait for dinner. made this tonight. it was really good and easy. thanks! It would be more than a cup with the chicken and pasta. Not sure exactly how much, sorry! I bet this would be great with a nice Ceasar salad on the side! Can’t wait to try it this Sunday! Is there any reason not to cook on high for 3 hours instead? I am trying on 3 hrs today since I just remembered that I should make dinner! Let’s see what happens at 6 pm! How did it turn out if you cooked it on high? Is there a way too cook this in the oven? How high of a temperature would it be? How can you change the recipe so it only serves two people ? can you use non- chunky tomatoe sauce if you wanted too ? I’m trying to make this recipe with only 2 ppl also. Did anyone reply to your question? Hi! Did you end up trying it for two people? I’m wanting to try it tonight for my son and I. Should I boil the chicken so it doesn’t make the sauce runny and also get the extra fat off? I wouldn’t, you can cut any fat off the chicken. I think the juices from the chicken make the sauce the perfect consistency. It’s like adding a touch of chicken broth. It tasted fantastic! Thanks for the awesome recipe! That is great to hear Brooke! I’ve been wanting to make chicken parm for a while but haven’t been able to with my 11 month old constantly being attached to my hip so I’m super excited to see how this turns out tonight! 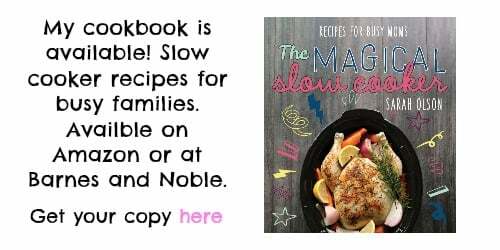 Slow cooker meals are this mamas best friend! I’m not cook savy enough to have known this could be made in the crock pot before now haha. Can you double the recipe? Will it all fit in the crockpot? Mine is pretty big, it’s oval and has an insert. 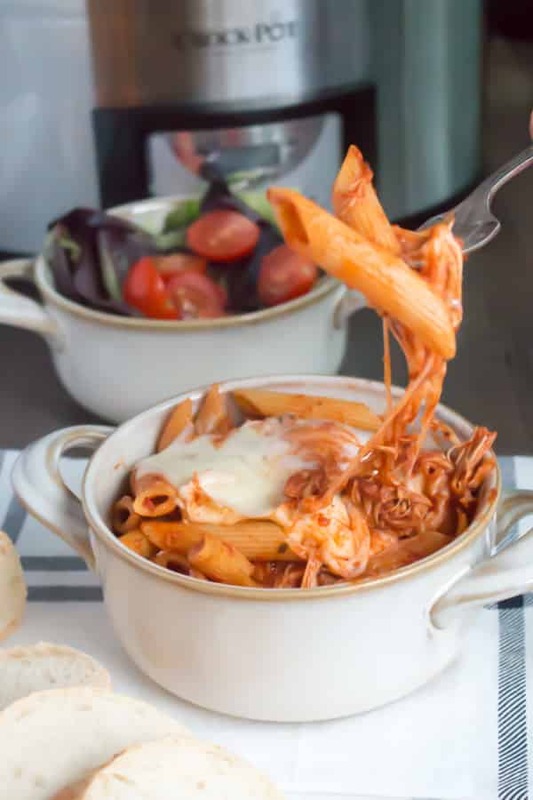 The only problem you may run into is when you add the pasta, it may be over full at that point, but you could spoon part of it into another dish if your run into that problem. I use the dry leafy kind, not ground. Why flatten the pasta? Then just lay it on top? If I wanted to make this for someone else as a freezer meal what would I need to do differently? I think if you bagged up the sauce stuff and chicken, freeze that. Then give them the pasta and cheese on the side. Pasta can be cooked al dente and then frozen. So you could cook the pasta in advance for a freezer meal. This is seriously so good!! I only used one can of Ragu (meat one) had the chicken on high for 4 hours and only used one box of noodles. DELICIOUS! How many chicken breasts should I put in the crockpot? Hi Madison. Chicken breasts from different brands can each weigh differently. I am used to eyeballing how much a pound weighs. Even better, use how much chicken your family will eat, this recipe isn’t easy to mess up! I always do this with different tomato sauces for different flavours. Thank you so much for this one. Is my fav pasta recipe so far. Hi five to your mum! 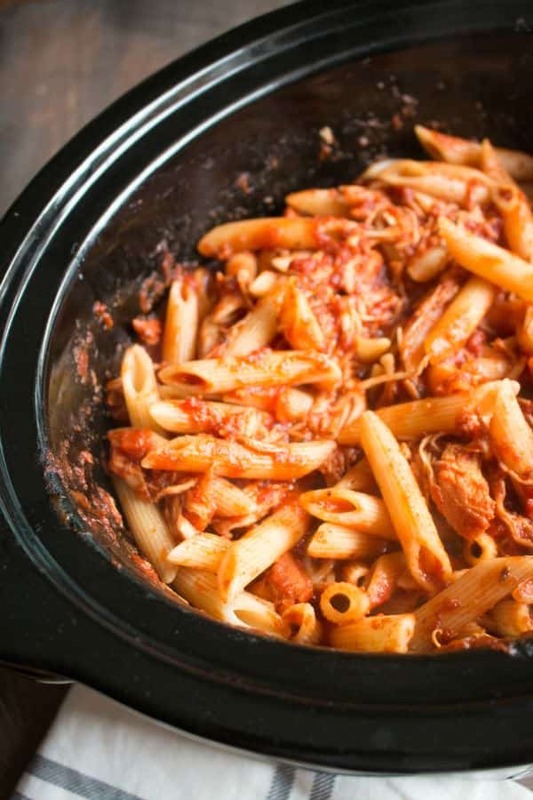 I just made this with whole wheat penne–it is soooo good and the macronutrient breakdown is great too! 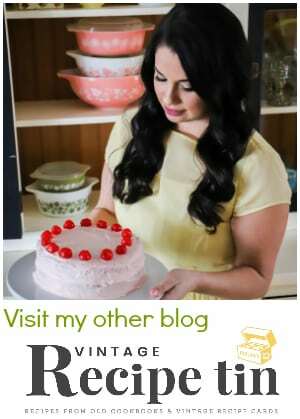 So glad I found your blog and thank you! 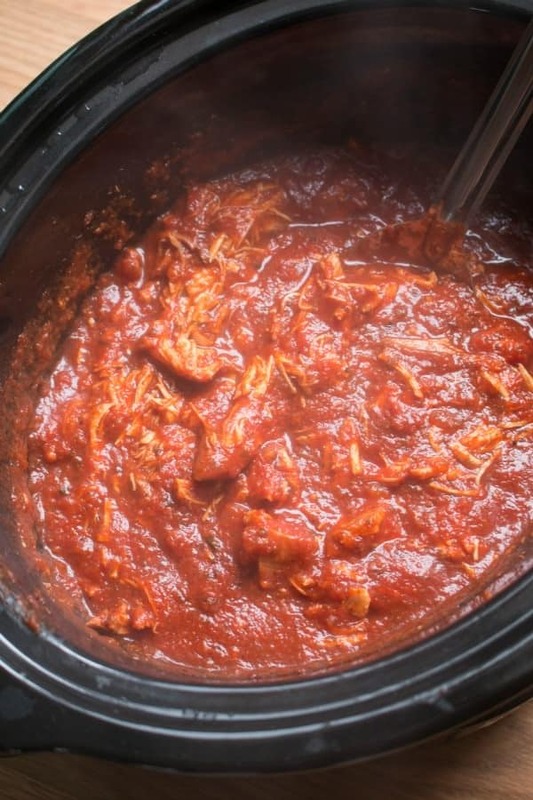 Would it be okay to cut the chicken into pieces before putting it into the crockpot? Would it make a difference in how it is cooked? I think it will cook up fine. Though it still will be shredded meat because when everything gets stirred together, the cut up chicken pieces fall apart. Can I use skinless boneless chicken from butcher? Also do you think I should brown the chicken? And bread them? Any boneless skinless chicken would do fine. You can brown them if you want. If you bread them, they will get soggy. Is the Parmesan cheese shredded or grated? Thanks for replying. I have both in the house, shredded and grated, but didn’t know what you had used. I will most likely make this meal within this upcoming week. My family absolutely loved this meal! So flavorful. My husband and son are really picky but went back for seconds. Thanks so much for the recipe. you need a phone app!! Hey i am trying to cook this now. I accidently put 4ish lbs of chicken. Do i need to double other ingredients to make this okay? I thought it needed 5lbs of chicken. I think this should be fine, you could take out some of the chicken after it’s done cooking and use for something else. Then carry on with the original recipe. If you double everything else it won’t fit. Hey thanks for getting back to me. It turned out good. Thank you so much. Love this recipe. So good and super cheesy! I’ve made it twice now and use this recipe for when I want to make planned-overs (i.e. making lunches for work for the week). It usually makes about 7 servings for me. I couldn’t find the Chunky Tomato, Garlic and Onion Ragu this time, so I improvised and added a half teaspoon of garlic powder and a half teaspoon of onion powder to make up for it and it still turned out pretty awesome. 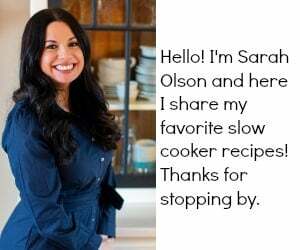 I use a 4 quart slow cooker which is really pushing it. It just barely fits all the ingredients in but it’s still doable! Would recommend to anyone who is new to cooking or needs a really easy meal. This is super good. This time I was thinking of adding zucchini and spinach. Any advice when I should add it so it’s cooked a little bit. I would add the zucchini 1 hour before adding the pasta and the spinach at the same time as the pasta, it will wither down very quickly! I hope that helps! Has anyone tried adding uncooked pasta at the same time a the other ingredients instead of cooking it on the stove and adding it? I was curious about this too. Did you end up trying it? I tried once that way because it was late & I was in a rush. The pasta did not get as tender & it did not taste as good. It tastes much better when follow the recipe by boiling the pasta & then adding it. Great recipe! Made it tonight and turned out really well. I basically followed the recipe to the T, and felt the only drawback was that the chicken was kind of dry after 4 hrs on high. But my husband liked it – this is a recipe for the books. Does the recipe call for a total of 48 oz of ragu or only a total of 24 oz? I assume I can use chicken thighs and then just decrease cook time? This looks so yummy. I need to make this for 8-10 people. Any advice on the amount of ingredients ? This recipe is so easy and oh so delicious. My 2 year old grandson told me that it was very yummy. Whenever I make it I have to set aside a container for each of my married son’s to take for lunch. I gave some to my sister and everyone at her house loved it also. Thank you so much for sharing the recipe. What about using a different brand then ragu, like classico? I’m trying this recipe tomorrow. I’ve never really cooked before so fingers crossed I don’t somehow mess it up! Just scrolled back and found my original comments from December 2016. Made this today and it was more yummy than ever! 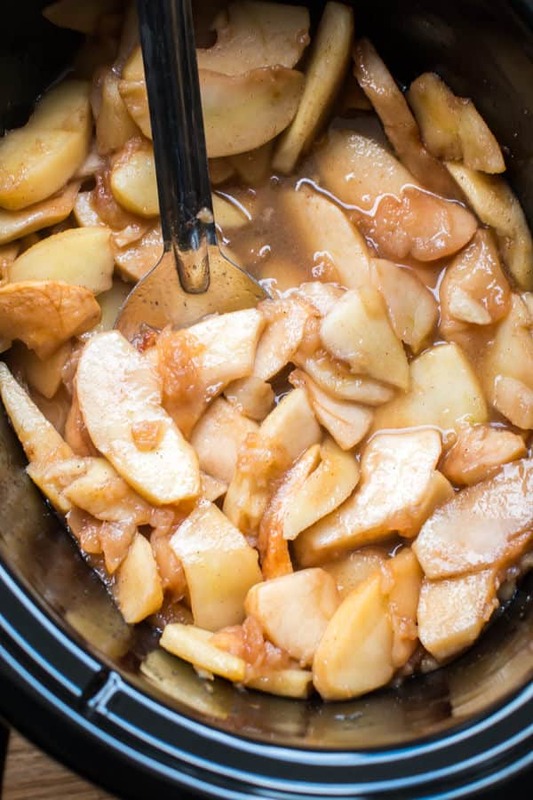 Pssst…have lost count on the number of times it has graced my slow cooker. Thank you again, Sarah! I love your comments Debbie from Florida! So glad you have found a favorite. Can you put ricotta/egg mixture in here if so, when? dinner tonight. She made it with spaghetti instead, and I must say it was outstanding. I definitely pinned this recipe. Easy AND delicious. I’m so happy to hear that Babs. We love this meal too. It seems everyone has cooked this on HIGH…has anyone cooked on LOW? And if so, for how long? 6-8hrs is too general. I don’t want the chicken to be dry—( so is it closer to 6hrs or 8hrs is the issue). REALLY looking forward to dinner tonight. 6 hours will be perfect. The chicken doesn’t get dry in this, there’s so much sauce.